Candidates who have already applied for Group-II Services Recruitment pursuant to Notification No. 20/2015, Dt. 30/12/2015 need not apply again. Their applications hold good for this Group-II Supplementary Notification also. The applicants who possess the requisite educational qualifications as on 30- 12-2015 and eligible in respect of age as on 01-07-2015 as per rules subject to their eligibility and satisfying the terms and conditions of the Notification are also eligible for the vacancies already notified in Notification No.20/2015. The applicants who do not possess the requisite educational qualifications as on 30/12/2015 pursuant to Notification No. 20/2015, Dt. 30/12/2015 are not eligible for the vacancies notified vide Notification No. 20/2015, Dt. 30/12/2015. Similarly, Applicants who have not attained the Minimum Age of 18 years and for P.C.No. 3 (Sub-Registrar Gr.II) minimum Age of 20 years as on 01-07-2015 are not eligible for the vacancies notified vide Notification No. 20/2015, Dt. 30/12/2015. Notification. However, he/she is eligible for the vacancies notified vide Notification No. 20/2015, Dt. 30/12/2015. No Candidate shall submit more than one application and candidature of candidates with more than one TSPSC ID will be liable for rejection. Step: The Candidate has to visit the WEBSITE http://www.tspsc.gov.in and fill the OTR application if not registered earlier to obtain TSPSC ID. While filling the same, the candidates have to ensure that there are no mistakes in it. The Commission bears no responsibility for the mistakes, if any, made by the candidates. STEP: The candidates have to visit the website http://www.tspsc.gov.in to submit Application and Click on the Link with Notification Number and Name, provide TSPSC ID and Date of Birth to proceed further. STEP:-Immediately on entering the above details, the applicant will get payment gateway of SBI ePay. STEP:-The applicant should pay the prescribed fee as specified through any of the four modes of payment online. Separate instructions have to be followed for each mode of payment. STEP:-After payment of fee, the PDF Application will be generated which contains the particulars furnished by the candidates. The ID No in the PDF Application form has to be quoted for future reference/correspondence. TSPSC Group 2 Results 2016-17 : Telangana Public Service Commission TSPSC is going to publish the exam results of TSPSC Group 2 Exam on their website . Candidates who have appeared for the Group 2 Exam held on 11th and 13th November 2016 can check their TSPSC Group 2 Results using the link provided in this post. 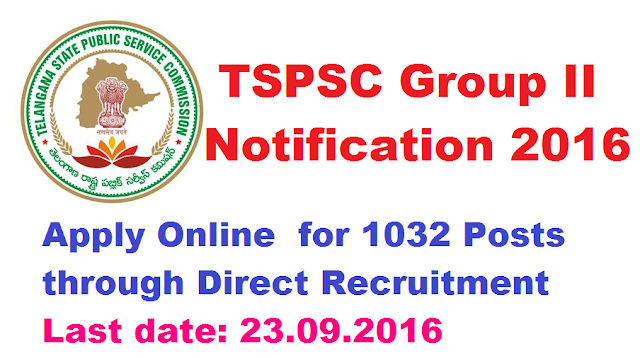 Going in to details, TSPSC has invited applications from job seekers to fill 1032 Group 2 services vacancies. Many aspiring candidates have registered for the notification through online mode. After that, all these applicants have downloaded hall tickets and sat for the written examination held a ta various examination centers across Telangana State. In this post we have provided you with useful information about TSPSC Group 2 Result 2016, TSPSC Group 2 merit list, cut off marks. Find What’s New section provided on the main page. Under that look for link to TSPSC Group 2 Result announcement. Click on the link and wait till the page is fully loaded. Enter your registration details like Hall Ticket no., Date of Birth, etc. And then click on submit button to generate your results. Download and take a printout copy of your result for future use.